Borderlinx | Buy Marks and Spencer and ship worldwide with Borderlinx. Cheap rates guaranteed. Do you want to look good but not have to pay an arm and a leg to do so? If so, it sounds like Marks and Spencer UK is just what you're looking for. With more than 120 years of experience under their belts, Marks and Spencer fashion has something for every taste. Sophistication is the key at Marks and Spencer UK with a clothing range that can give the final touches to an already classy wardrobe, or be the foundation if you decide it's time to start over. And Marks and Spencer UK is not just a leading clothing retailer. They offer home decorating products, food and drink and much more. At Marks and Spencer Clothing you can find what you're after for him or her and for the little ones as well. For women, it's time for a 90s revival and Marks and Spencer UK has just what you need, while for men, why not look at the new smart-casual collection inspired by British sport. And what about Marks and Spencer Home products? What could be better than some top quality casserole dishes or chopping boards to cook up a feast? Whether it's clothing, products to brighten up your home, or the wide range of top quality food and drink, you can rely on Marks and Spencer UK to offer the very best at competitive prices. 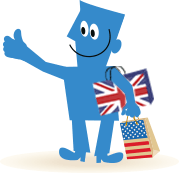 Use Borderlinx to buy from Marks and Spencer UK and ship to your home country at a cheap cost, and do it with international shipping, tax and duties paid up front. Use our Shipping cost calculator to work out tax and duty costs. And that's not the only service on offer through Borderlinx. Your international order will be made easier with our concierge, free repacking and consolidation services.